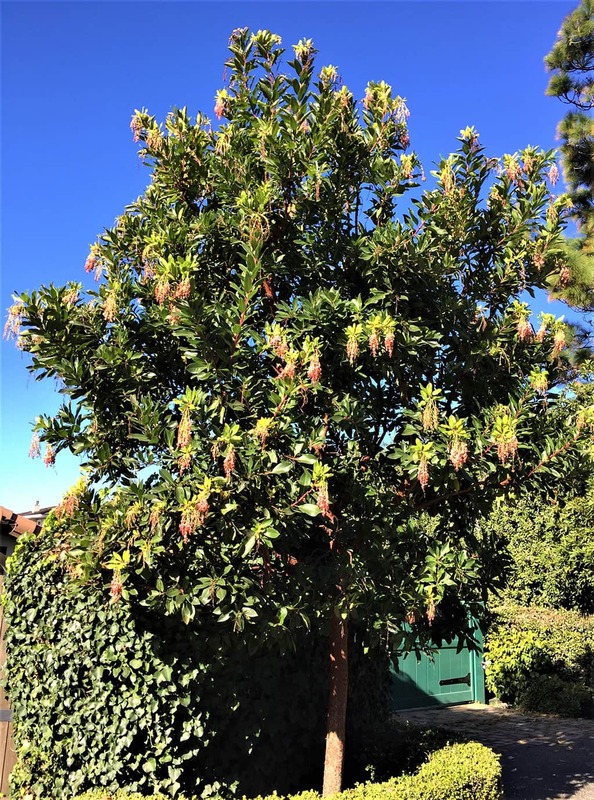 The Marina Strawberry Tree, Arbutus ‘Marina’, is January’s Tree-of-the-Month, although it is truly a tree for all seasons in Santa Barbara. Attractive year-round and easy to maintain, it has become a favorite tree selection for our home gardens, parks, and commercial landscapes. 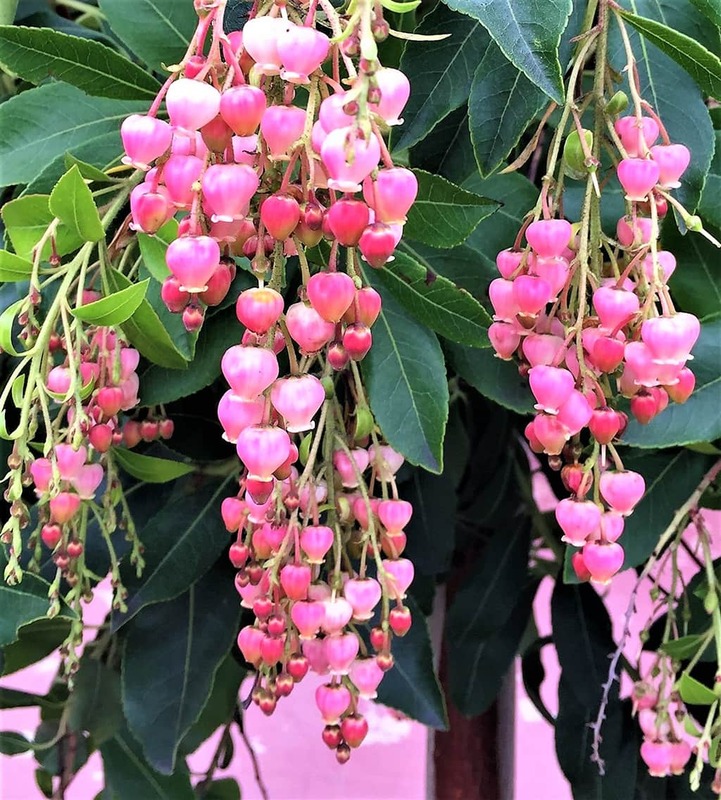 This tree’s popularity is certainly well deserved, as it bears evergreen leaves, lovely flower pendants, attractive fruit, and sculptural trunks and limbs. It was a relatively new (1984) introduction to nurseries and landscaping. All those available today come from a line which originally appeared in a 1917 horticultural exposition and was thereafter maintained in a now closed nursery in the Marina district of San Francisco (hence the name ‘Marina’). It appears to be a hybrid of the standard Arbutus species (Arbutus unedo, cultivated for centuries in the Mediterranean and Europe) combined with another Arbutus species. 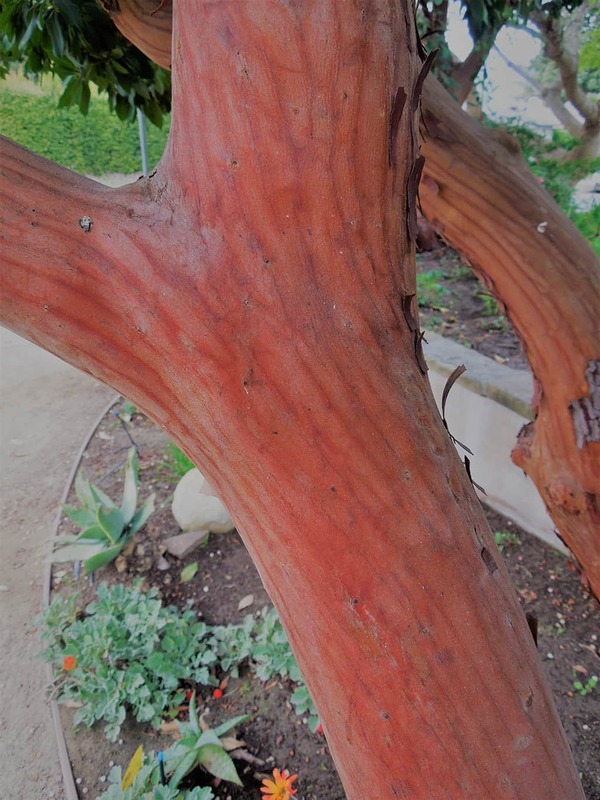 It has similarities to our native Madrone tree (Arbutus menziesii); however, the ‘Marina’ variety is much more adaptable to various growing conditions and easier to grow in cultivation. It has a dense, rounded canopy, with 4 to 5-inch long leaves that are a shiny dark-green above and pale beneath. Pendants of bell-shaped flowers, pink to red, can bloom all year long, but are most abundant in fall and winter. 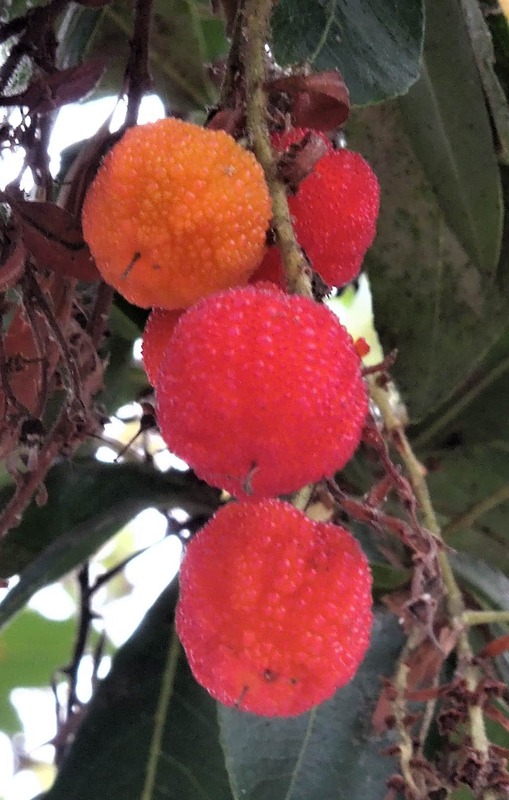 The fruit is a round berry, ¾ inch across, with a bumpy skin that starts yellow and turns strawberry-red when ripe, resulting in the common name of Strawberry Tree. While the fruit is edible, it tastes more like a gritty kiwi than a strawberry! Fruits mature in the fall, so fruits and flowers can be seen on the tree simultaneously, adding to its ornamental interest. The fruits attract seed-eating birds, while the nectar- and pollen- bearing flowers attract bees and humming birds. Over time, the light-gray outer bark shreds away in thin strips, to reveal the reddish to cinnamon-brown inner bark – perhaps this tree’s most remarkable feature. Unlike the standard Strawberry Tree that grows to 20 feet tall, Arbutus ‘Marina’ can grow to a height and spread of over 40 feet. Fortunately, it is relatively slow growing; with minimum pruning and maintenance, it can fit into just about any sized garden. This lovely hybrid is surprisingly tough and can tolerate drought and most soil conditions, though overwatering and poor drainage can cause root and foliage diseases. The Marina Strawberry Tree can be used as a multi-trunked tree, to make a broad-spreading feature in the garden, or as a single-trunked tree, for smaller more confined spaces. In all forms, this fine tree adds amazing beauty to any garden, all year long! Street trees can be seen in the 1500 and 1600 blocks of Mountain Avenue and the 1900 block of Bath Street. Private garden trees are found at Sola Street at Mountain Avenue and at Micheltorena Street at Chino Street. There are two mature trees in East Alameda Park by Kids’ World.